We are horrified and heartbroken over the shootings at the Cultural Centre of Québec Grand Mosque in Québec City Sunday night that has left 6 dead and 19 injured, 2 critically. Among the injured are children. 2016 statistics show that incidents of hate crimes against the Muslim community had doubled over a three year period and much of this has been and continues to be fanned by some Canadian politicians seeking to vilify muslims and cast dispersions against the entire community. These anti-Muslim sentiments frequently are whipped up rhetoric, designed intentionally to created fear and hatred by some political factions in order to weaken opposition and consolidate support in communities looking for simple scapegoats to their much more complicated problems. In fact, Muslims are more often the targets of radical violence and the Muslim community stands vocally opposed to terrorism in all forms. We must rise up together and oppose this ongoing campaign of fear and division. 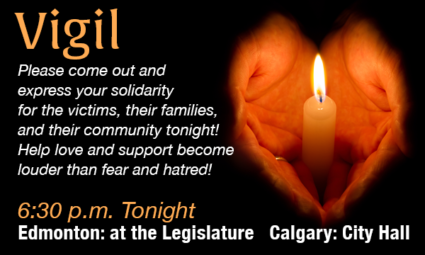 Join us tonight, January 30th at events in both Edmonton and Calgary at 6:30 p.m.